A good panel-raising jig makes it easy to raise panels accurately and safely on the tablesaw. My jig is easy to build. You can use it to raise panels made of veneered MDF or solid wood. It's important to use featherboards to keep the panel tight to the auxiliary fence as you move the panel through the blade. (See drawing, opposite page.) The featherboards shown here are available for $10 each from WtxxJworker's Supply, (800) 853-9663. Or see page 78 for tips on making your own out of wood. Plastic laminate glued (with contact cement) to both sides of the auxiliary fence helps the panel slide sm<x)thly and prevents the fence from warping. Even the best tablesaw blade leaves a beveled surface that needs some scraping and sanding. The key to accurate results is cutting the bevels very slightly oversize in thickness, so that sanding gets you down to the final dimensions. You can raise panels of different thicknesses using the same jig, but you'll have to set the fence and blade angle anew, and raise the blade through the jig again, for each new panel thickness. —P.5. Saw the bevel. 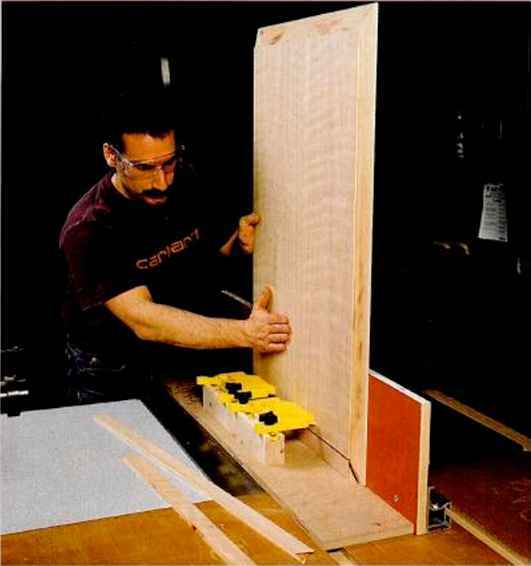 The author's jig helps hold the panel vertical while he pushes it through the angled blade. Featherlx)ards contribute stability and safety. Press the veneer. A vacuum bag and pump system clamps the veneer to the panel. Saporito uses J/g-in. hardboard cauls over and under the panel to keep the veneer flat on the MDF. Use a micered scrap to line up the mitered end of one edging piece at one corner of the MDF. Mark the miter's location at the other end. Cut the second miter a hair long and sneak up on the final length with successive cuts. Glue two opposite edging pieces to the MDF panel with biscuits. Dry-fit the remaining two edgings, and if they're a tad long, shoot the miters with a plane or trim them on a saw. (For more information on cutting and trimming miters, see AW #66, page 44.) Then glue on the last two edging pieces. Use pipe clamps as shown in the photo on page 71, and make sure the clamps don't pull the edging out of level with the panel. I use a long straightedge to check this. I place clamps about about an inch from the miter joints, and every 6 or 8 in. apart. I select a very fine veneer for the outside face of the panel. If I'm making high-end cabinets for an insistent client, I'll use matching veneer on the inside. Most of the time, though, I use a less expensive "backer" veneer on the inside face. In any case, it s imporcant for the front and back veneers to be the same thickness. 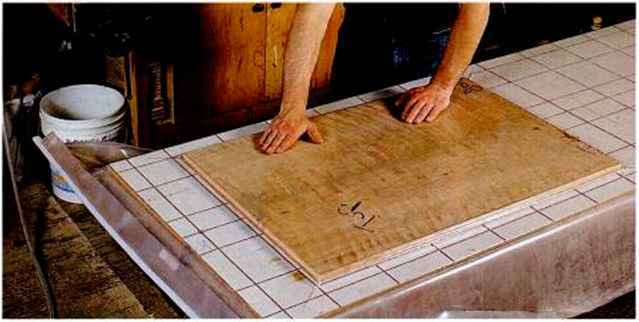 You might find veneer leaves large enough to cover the entire panel, or you can match two or more consecutive leaves to cover it. When you're matching, the rule is: For an even number of leaves, flip every other one so that each seam is bookmatchcd; for odd numbers, lay them out in the order they come off the flitch so that the scams arc slipmatchcd. I cut the front veneer about V^ in. smaller in each dimension than the assembled panel. 1 cut the backer veneer about V2 in. bigger in each dimension than the whole panel—you'll trim the overhanging edges flush later.